Paprika is a 2006 anime movie directed by Satoshi Kon, which tells the story of the eponymous Parika, a lively woman who works as an off the books therapist with idiosyncratic methods of infiltrating her patients’ dreams and is one day called upon by a police detective trying to solve a murder case. The film is notable for being the last movie Kon directed before passing away, as well as arguably his most visually and intellectually significant work to date. 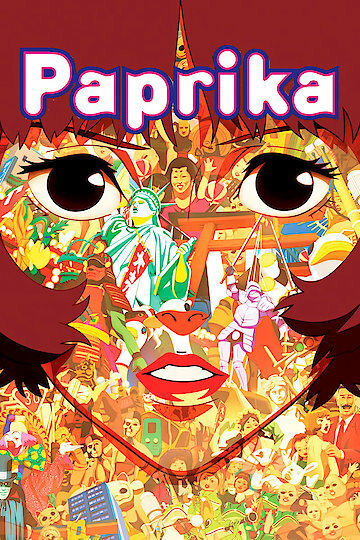 Although some have compared it to other more popularly renowned movies involving a premise of the submergence into the subconscious world of dreams, Paprika is actually based on a 1993 novel of the same name, in keeping with Satoshi Kon’s tradition of adapting most of his features from source materials relative to his psychosomatic aesthetic. The movie also delves into topics previously explored by the director of identity, reality versus idealized denial, and redemption through self-discovery on a more concrete level without shying away from Kon’s trademark extravagance. Paprika is currently available to watch free on Crackle and stream, download, buy on demand at Amazon, Vudu, Google Play, iTunes, YouTube VOD online.